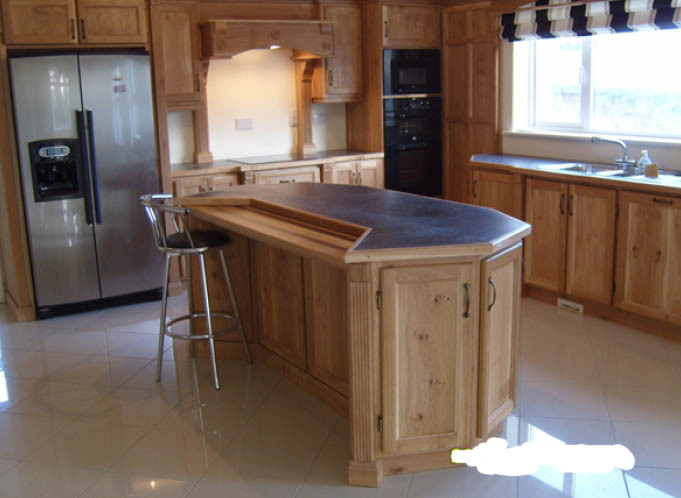 Our solid Character Oak Kitchen’s are designed to suit every style of kitchen. Black Granite worktops go very well with rich character in the oakd finish. We also create islands with lots of seating space. The top of our kitchen are dressed with our own cornice and dentil. Comparative to a more contemporary white oak this Character oak, sometimes mistaken for Pippy Oak, has lots of knots and distress hence the name Character Oak. All the kitchen doors are inframe with a varity of handles to suit your style. A bespoke wine rack and curved kitchen doors can also be accomadated. All the kitchen appliances can be integrated. The dresser and appliance wall mave have larders plate rack and / or shaker style glass doors.